Good morning! It's a gorgeous day, and none better to share a sneak peek of the upcoming June release from Peachy Keen Stamps. Friends, let me tell you that you're going to LOVE these new stamps. I know, I know, I say that every month, but they just keep getting better and better. I did lots of paper piecing and cutting on this one, which was tedious, but I love the result. Not only does this show off some of the new stamps coming out, it also gives you a sneak peek of the newest Peachy Picks Kit. This one gives you a closer look at the layering and cutting that went into this one. I even did a little Copic coloring to give the layers more depth. Gotta be careful coloring on patterned paper, because those alcohol markers can be very unforgiving. Great results, this time! The full reveal of the new release will go live at 6 p.m. (CST) on Tuesday, June 5th. 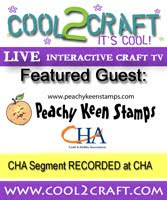 Mark your calendars, because we'll be celebrating with a release party over on the Peachy Keen Connection, where we'll share more inspirational creations from our PKS Designers, chat, play a game or two, and offer some challenges for you to play along with. Of course it wouldn't be a party without prizes, and there will be plenty of chances for you to win. Join us for ALL the fun!!! If you're a member of the Facebook community, HERE'S a link to our event page where you can join the party! Hope to see you there!!! Have a blessed and beautiful day filled with happy stamping! Adorable card Lorie. Love the bling! WOW beautiful! I Love all the details and colors! Great piecing patience! This is just BEAUTIFUL! I love those cute birdhouses and birds! I am so excited for this release! WOW! I am loving those stamps and the way you colored and layered everything! Adorable ! Love the layer and the 3D look. beautiful Lorie, love the dimension you added! Lorie your coloring and paper piecing details are breathtaking!! I also LOVE all the little bling!! What a pretty card... love that tree! This is card is just so Beautiful. Awesome coloring and love the dimensions on the tree. Oh, my gracious! This tree is divine and you've highlighted it so beautifully with those colored houses and layers and bling! I'm in awe! And thanks so much for stopping by to leave me some love during the MSS June/July Release! I so appreciate your visit!